Gulf Shores condos for sale in Beach Life are just one block north of the public beach access and two blocks away from the Gulf Shores Hangout. 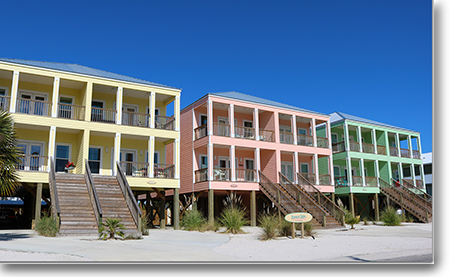 Like Spinnaker Pointe, Beach Life will consist of several duplexes with two-stories each and covered parking under the building. Each unit will offer 1,552(+/-) square feet of space with three bedrooms and three bathrooms. Each condo will have beautiful covered balconies on the north and south sides of the condo. Beach Life will be surrounded by a wooden privacy fence, except where there is frontage on 1st Avenue. Three of the duplexes will be right on the road and another will be at the northern end of the property. Within the fence will be a big pool surrounded by a wooden sundeck. Each condo will have an assigned poolside cabana where residents and guests can relax. There will be grills by the sundeck that are perfect for grilling up your latest catch for a poolside picnic. There will also be a big fire pit surrounded by seating for small and large groups. Volleyball and shuffleboard courts can also be found by the pool. Throughout the Beach Life property will be natural sand areas and landscaped with palm trees carefully placed to enable hammocks to be set up all over the place. Beach Life is still under construction, but one duplex was finished in June of 2016. As with most of the low-density condos in Gulf Shores, Beach Life offers an amount of privacy that high-density developments can't. Beach Life is within walking distance to a number of Gulf Shores restaurants, shops, and entertainment venues. Please let us know if you would like further info for Beach Life or any other condos, homes or real estate along the Gulf Coast or would like to schedule a private viewing by emailing info@condoinvestment.com or by calling (251) Area-Pro (251-273-2776) for immediate assistance.